Last week Lily was bored and I had just finished working so I got into my crafting tub and at first I thought about letting her paint and then I noticed the stickers Waldo picked out for her while we shopping. I decided that a collage would be a better idea. I had a couple pieces of tissue paper and this kind of shiny, slick, red on one side and silver on the other side scrap of wrapping paper left, so I grabbed them, some small squares of poster board and a glue stick. 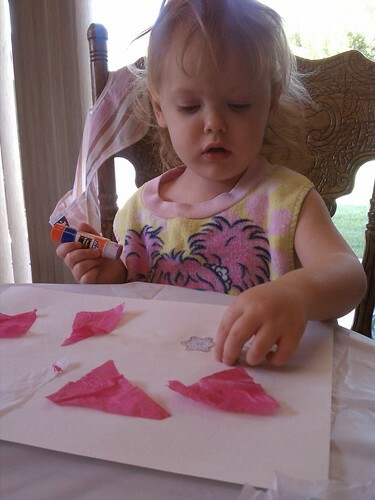 I set Lil up at the kitchen table and set to work cutting pieces of the paper for her and explaining what to do. She’s done a collage before, but it was a while ago so I gave her a small refresher course. She caught on right away. 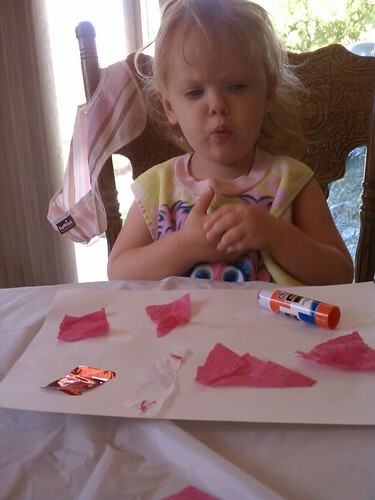 I could not convince her that stickers don’t need glue. I was a little surprised that the stickers stayed on because the paper was so wet from the glue. Lily is really figuring out what being two is all about the last couple of weeks. 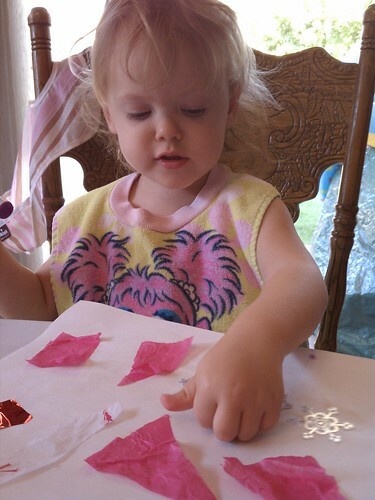 And the morning of the collage was an especially trying morning and taking a little break to do something fun with Lily was all it took to turn our day around and made all the difference in the world.